As some of you may remember, at the beginning of August, we started transitioning Ivi and Rylie to a fresh dog food diet. Having read many of the benefits of feeding homemade, real food to your dogs, my husband and I both thought this would be great to try for our two girls. What intimidated us, though, is the amount of work involved in making healthy dog food, especially when it comes to making sure it meets all of our girls’ nutritional requirements. Lucky for us, while we were at BlogPaws, we were introduced to NomNomNow – a fresh dog food delivery service that delivers fresh, gently cooked dog food that is delivered right to your door! When they asked if Ivi and Rylie would be willing to try they food for a month to get our thoughts, we have to admit, we were pretty excited and couldn’t wait to tell you guys about it. While we are only a little over two weeks into our testing, we are pretty excited to tell you guys about how it is going so far! So, what is exactly is NomNomNow? Honestly, it is the perfect answer for anyone wanting homemade real food for their dog or dogs, but without the time or knowledge to fix fresh, healthy food for their pups. In other words, NomNomNow is a fresh dog food delivery service that delivers gently cooked dog food right to your door, using only all natural, human grade ingredients. As well, each of their recipes are veterinarian formulated and certified by their own Dr Justin Schmalberg (one of the top pet-nutritionists in the United States). While that is all well and good, they know there is only one thing that are our dogs care about – the food! It doesn’t matter how great it sounds to pet parents, if the food doesn’t taste amazing and seem like their human’s food, it isn’t interesting, right? 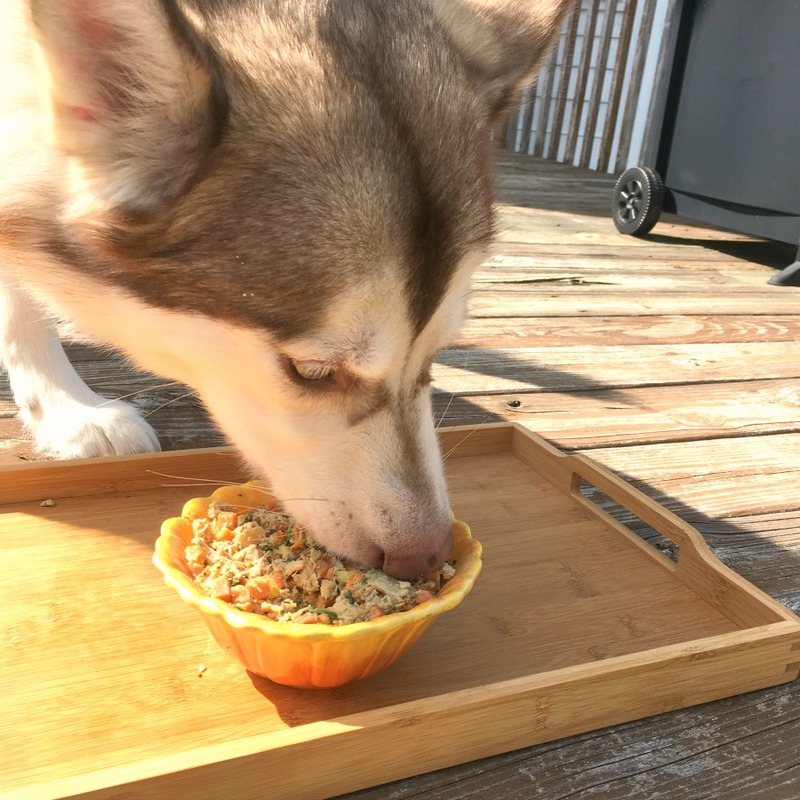 Right now, NomNomNow offers 5 delicious recipes and 1 flavor of treats that they are certain will appease even the pickiest of doggy palettes. As well, each of these recipes made using no additives, no artificial ingredients, and only the best, human-grade, restaurant-quality ingredients all from the USA. All their food is human grade and all natural, even the vitamins! In other words, your dogs will think they are getting human food with each bite, making breakfast and dinner an amazing experience for everyone in your family. We also highly recommend reading how it works to learn more about NomNomNow and why it is a great choice for any doggy family! So, what do Ivi and Rylie think of NomNomNow so far? While it has only been two weeks, I have to say that this food has been a major hit. Normally the girls, especially Ivi, get tired of just about any food after four to seven days. Ivi in particular will be so disdainful that she will actually try getting the puppy to finish her food, in hopes that something ‘new’ will appear in her bowl. With NomNomNow, each meal is something of pure excitement. 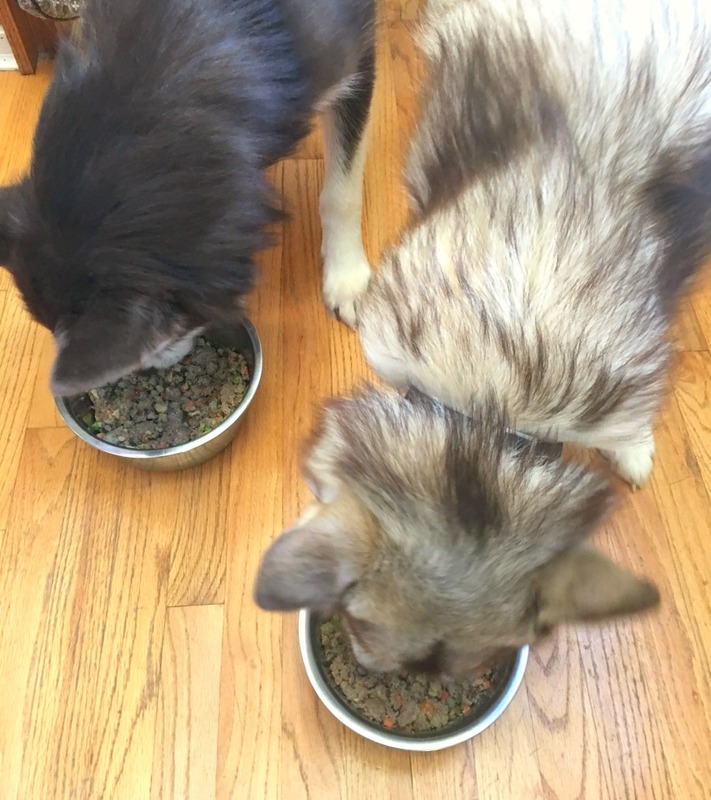 They are so excited about meal time they have started to take their bowls and bring them to us – something we never taught them or thought they would do – in hopes of getting more fresh dog food to magically appear in their bowl. For Ivi, this has especially been weird since she NEVER asks for seconds. I actually was a bit worried she didn’t have enough food since we had never seen this begging behavior from her. Luckily, NomNomNow put a warning in the starter book that this is pretty normal – dogs will do anything, including trying to open the fridge (not ours, but someone reported this to NomNomNow customer service!). While the girls love the NomNomNow experience, what do mom and dad think? Really, it has been a pretty easy, enjoyable experience. The hardest part is remembering to bring more food up from the freezer (remember, we had a month sent to us ahead of time as part of their beta. If you live on the west coast, you get fresh food sent to you each week). Our only joking complaint is actually a major benefit we have seen from NomNomNow – both the girls have so much energy! Don’t get me wrong, our girls have always been active and playful, but they are bouncing off the walls since we started. Playtime is a much more enjoyable experience and the mischievous play has gone up as well, letting us know we have two happy dogs that are getting enough to eat each day. Even though we are only halfway through our testing experience, it has so far been delightful for happy go lucky malamutes and their doggy parents! 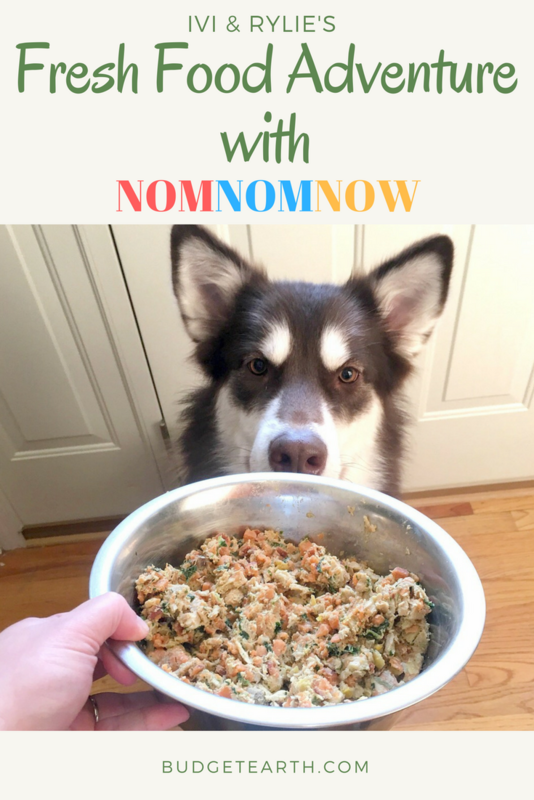 Curious what your own dogs will think of NomNomNow? After seeing the benefits of feeding a fresh dog food diet to our girls made from all natural ingredients, we can’t wait to see what you guys think! Since NomNomNow knew you guys might be excited to try their fresh dog food delivery service, they decided to offer an amazing deal on their food for our readers. Currently, they are offering all Budget Earth readers 50% off your first two purchases using this link or by using promo code BUD52 at NomNomNow.com. Don’t worry, sign up is extremely easy and they even offer multi-dog family discounts! Make sure to head over there today to see how NomNomNow can help your dog today! Want to learn more? Check out NomNomNow on social media! My aunt has three St. Bernards and I’m sure they would love this dog food. It is amazing you notice they have more energy. I got a big kick that Ivy tries to get the puppy to finish the food, so something new will appear! So cute! This is a great concept. I thin of the food as an investment in good health! i would love to try this food for my ouo. This would be awesome for our two. One has very little energy. The other one has too much, but she would still probably get some benefit. Such a cool concept to pamper our beloved pooches. I love that this food is fresh! Seems like it would be so much healthier and I’m sure pup thinks it tastes even better! I would love for my dog to try this food. The food looks fresh and well-made. Wow, a kitchen that meets all FDA and USDA standards is fantastic, shows the company is serious about pet health and nutrition. I love that their recipes contain real meat and vegetables. I feel good about feeding my dog real food vs artificial ingredients. My friend is getting a new puppy soon. I’ll mention this to her. This is very healthy dog food and looks so good for my dog to try out. I like that there are so many different flavors and it is very fresh food. So much better than the packaged dog food in the store. I would love to try this with my 2 dogs,but it is not to be delivered in my area.I live in Oil City PA 16302. I wanted to try samples for my babies. I am glad that this has given your girls more energy. I can see how this would be a very valuable subscription for pet owners who do not have the time to make fresh food for dogs. I love this concept! I really appreciate that they do everything themselves in-house. It means you can trust their product. So glad I found this! I have 4 dogs. 1 small and 3 medium sized ones. Currently we spend about $400. A year on dog food. With NomNom that price increases to about $4,000 a year. I do recognize that the NomNom ingredients are much healthier than the dry food we purchase, cost wise I simply can’t afford to buy it. I love the fact that it is a raw diet that includes vitamins and healthy oils. This may be something I could add to their current food and still be cost effective. Nom Nom looks pretty good. Looks fresh and nutritious. Oh gosh. This sounds like it would be perfect for my super finicky pup. I have to look into it. Though his bowl is rather heavy (at least for a small terrier) and I hope he doesn’t try bringing it to me. I love that this dog food is nutritious with real ingredients and has great benefits. Sounds like amazing food, but definitely not in my budget. I have three very hungry Treeing Walker Coonhounds who would inhale this. I would like to try it for my girl, though, at some time in the future. Kyoko is having some health issues and I’m doing everything I can to keep her as healthy as I can. I will have to show my son this. He has a dog and would love this. I love the different food packages they offer. A little expensive for my budget; however, I bet it is worth the price. My dog is such a finicky eater. I would love to get Nom Nom Now for her . I think she would love it. That is great they have so much energy. I can’t wait to hear more progress as you continue with this food for them. This dog food looks healthy enough, and I do like that it has good ingredients which won’t harm your pets. Kado loves “human” food. It gives this old’ dog some energy and I love that. I have a chihuahua. He actually has too much energy for this old lady! These dogs are so cute! I’ve heard how much healthier homemade food is for dogs but it’s so intimidating! this sounds like a wonderful company and something I’ll look into for our dog. I love that is dog food is human-grade quality. I also love that there are no artificial ingredients, no fillers and the food is freshly cooked and not frozen. I love that their recipes contain real meat and vegetables. I also like that it’s sent to my door so I don’t have to go to the store. I love that this food is fresh. I am sure dogs love it! I’ve noticed that the new trend in dog food is fresh. It makes sense that it’s better for them. This is an interesting concept. I think many pet families would love this service. My poor baby has really bad allergies and this sounds like the perfect food for her. I like that I can also get her a veggie diet too. love the idea of feeding the dogs fresh food.and that it gets delivered to your doorstep.sure the dogs would love it too.wish i could afford it. It’s human-grade food! That is very important to me. I was always happy to cook up chicken for my dogs. But it’s great to have the option of NomNom because I may not always be making food that I would give to the dogs – like pasta. Nala, our dog, sure does love eating-lol. He could use some extra energy though, so perhaps if we tried this??? I know she would love it. This will be good for Hemingway since he loves to eat our food!! Fresh is best. I like that this service does all the hard work for you. I love that the foods are made from fresh products and I bet my three guys would love it! Such a great idea! Who won’t want to feed their dogs heathy food? Plus, you’ll have it delivered every week! Oh wow this is Great to have a service that does all this NomNomNow is a fresh dog food delivery service that delivers gently cooked dog food right to your door, using only all natural, human grade ingredients. I love that they only use fresh ingredients and only a handful of them!! All we can pronounce, say and know where they came from!! People have been transitioning to this lifestyle why not our furry friends? !